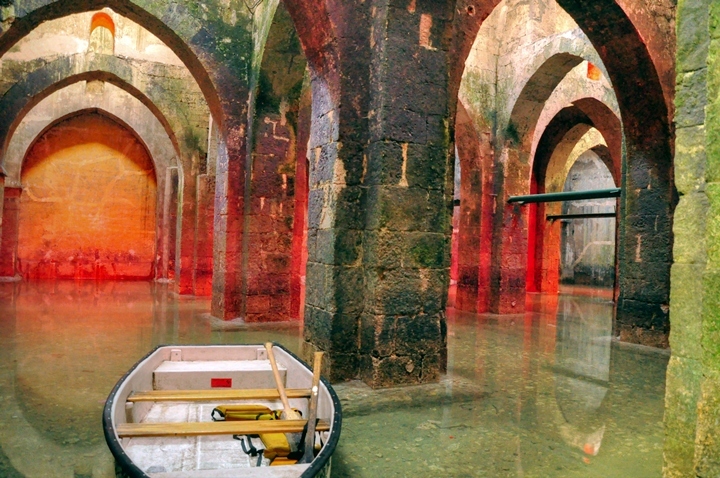 The Arches Pool is a 8th Century underground water reservoir. This unique tourist attraction, located in the center of Ramla, has row boats that allow the visitors to explore the reservoir. 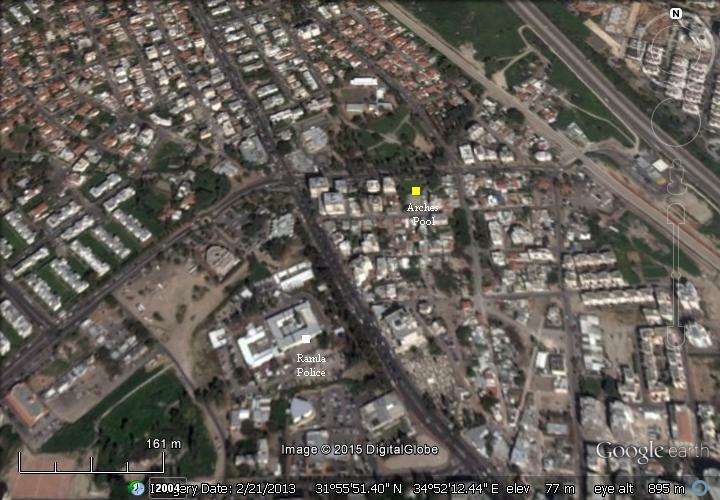 The site is located in the center of Ramla, on 12 Ha-Haganah street. The following aerial view shows the points of interest on and around the site. However, grand engineering solutions were required in order to provide a sufficient water supply, at a place where there were few natural solutions. 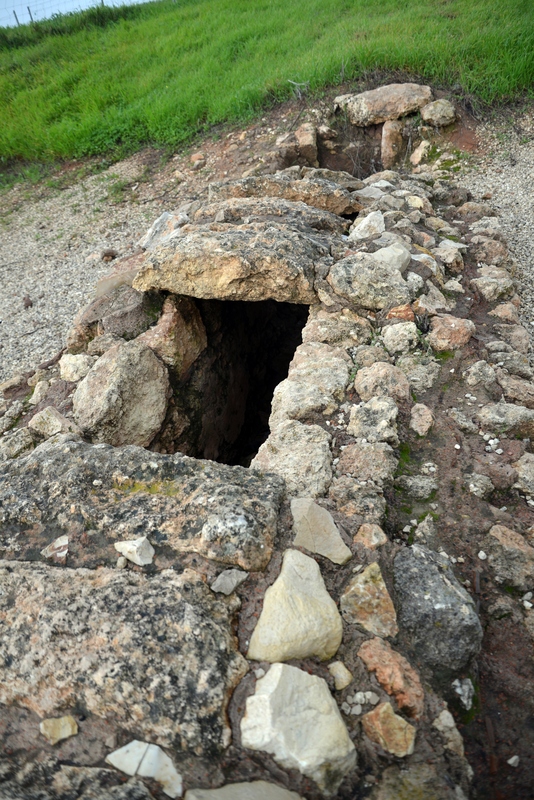 Initially, cisterns and deep wells were used. To fundamentally resolve the city's water supply needs, Sulayman built a long aqueduct in order to bring the waters from a group of springs located 12 KM south east of the city. These springs are located near Tel Gezer and the Ottoman village of Abu-Shusheh. 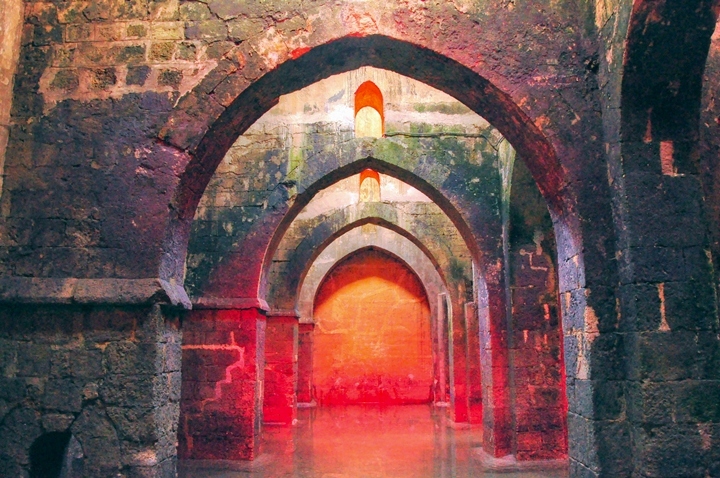 A large underground water reservoir, named today as the Arches Pool, was constructed and completed in the year 789. It received the waters of the aqueduct, as well as being fed from rainfall, serving the growing needs of the population in the new city. An inscription in the entrance wall names Harun al-Rashid, the fifth caliph of the Abbasid Caliphate, as the ruler who instructed to build this amazing structure. Al-Rashid ("the Just") ruled in Baghdad from 786 to 809, during the peak of the Islamic golden period, and is known to have inspired the tales of the famous Arabian Nights (1001 nights). The aqueduct was in use for 150 years. After then, the major flow to the pool of arches was suspended, and it dried out. As a result of the great earthquake of 1068 in the southern part of Israel, the city was severely damaged and subsequently the city's area has decreased in size. 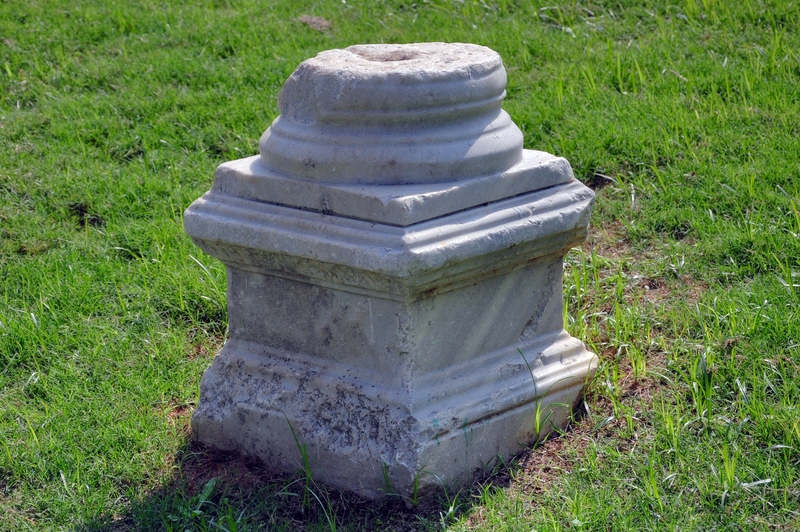 This left the pool outside the city limits and neglected until modern days. Christian pilgrims who visited the Holy Land in the 17th Century named the site as "Cisterns of Helena" as they mistakenly attributed the reservoir to the Holy Land structures built in the 4th Century by Helena, mother of the Roman Caesar Constantine the Great. "El 'Aneiziyeh - These vaults (commonly called the 'Cistern of Helena') measure 83 feet by 74 feet. The masonry is small; the vaulting has a pointed cross section. The cisterns were full above the crown of the arch in January 1874. 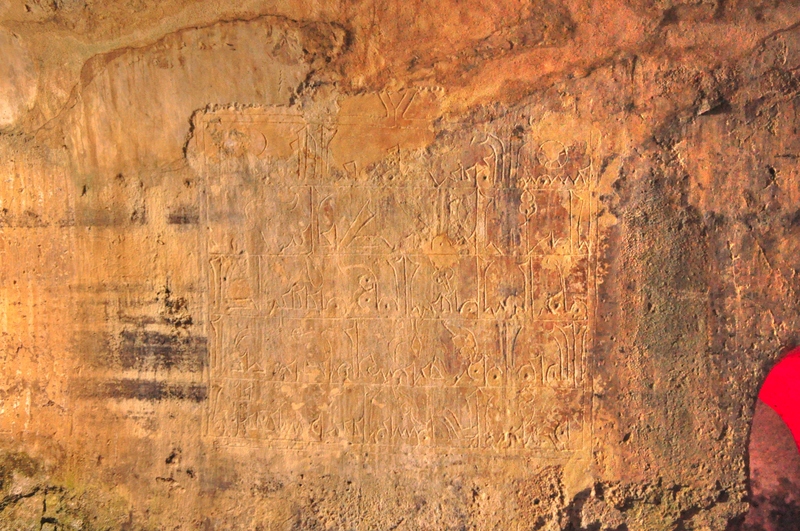 There is an inscription in Cufic on the plaster of the interior. 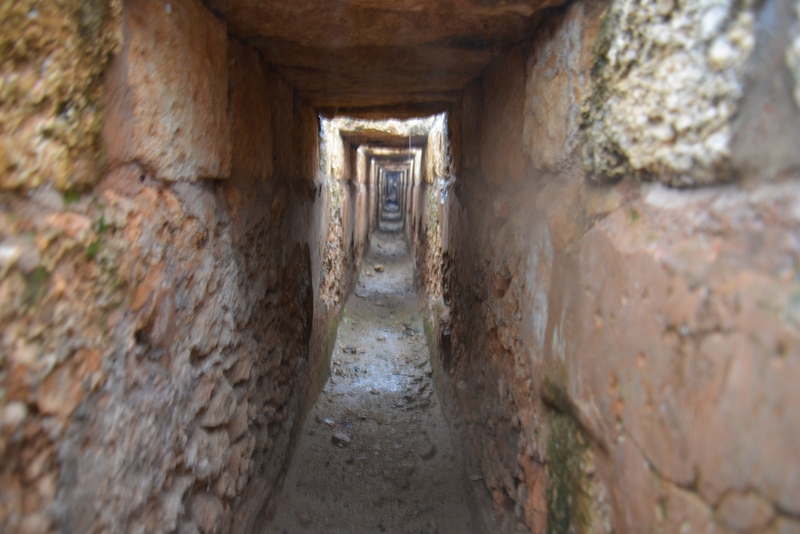 The cistern is mentioned as early as 1566, and seems to belong to the time of the re-building of Ramleh". The plan of the reservoir, as illustrated in their report (Vol II, Sheet XIII, p. 264). The pool covers and area of more than 400m2 (4300 square feet) . It plan is not rectangular - the southern wall is 20.5m (67 ft, or 74 as measured by the PEF survey) while the northern wall is 24m long (79 ft, or 83 ft as per above text). The site was researched in years 1934-1937 and cleared of the accumulated soil and deposits. It was then repaired, but refilled to the top with soil in order to protect it. The pool was once more cleaned in 1960 from years of neglect. 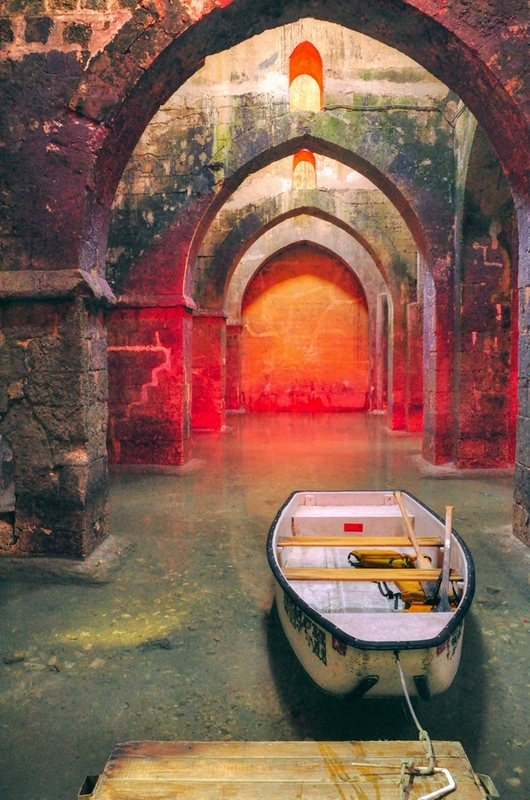 Small row boats were added to sail among the vaults, and the place became a tourist attraction. The water is filled from rainfall and irrigation water, which are seeping into the pool. In 2007 the site was closed for two years due to damages, and after conservation works the attraction was once more opened to the public. Five of the six original vaults are preserved. Don't miss this unique experience while visiting in Ramla. The kids - and adults - will love it! A view of a section of the pool is seen here. There are 15 cross shaped pillars that support the 6 vaults inside the water, and 16 square pillars along the external walls. A pointed arch stands above each pair of pillars. A small window, with the form of a pointed arch, is located on the top of the wall above the arch. The arches and the supporting pillars are made of ashlars, while the wall and the vaults are built of small stones. The entrance to the bottom of the wall is via a stone staircase, descending on the north east side of the pool. Row boats anchor on a modern wooden platform located on the northern wall. The row boats offer a great way to explore the pool. An Arabic inscription has been marked on the plaster of the entrance wall. It names Harun al-Rashid as the ruler who instructed to build the reservoir in 789. This inscription is written in Arabic Kufic script - an early angular form used in decorative inscriptions. It was developed in Kufa, Iraq, at the end of the 7th Century. Until the 11th Century it was the main script used for manuscripts such as the Holy Quran. On the ground level is roof top of the vaults, with openings that let light in. The water was also raised by buckets to the surface. The water entered into the reservoir via an opening in the western wall. In the garden is a small collection of marble columns and bases that were collected in the city. 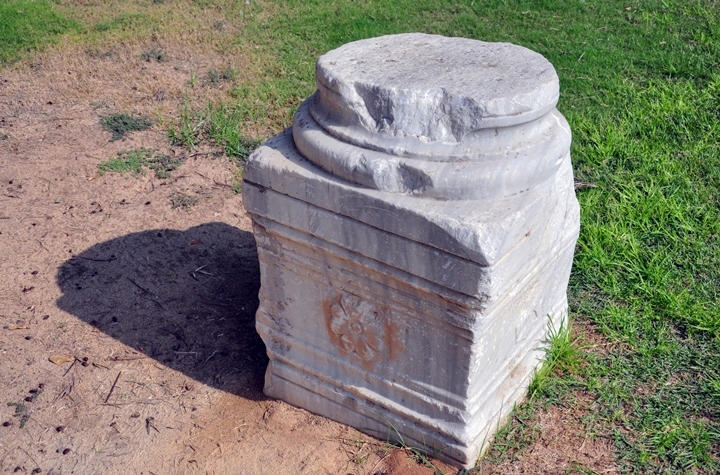 This section was found during the construction of road 6 (Cross-Israel highway), out of a total 150m segment excavated at the site. It can be seen by a short walk from the southern gas station along road 6. Other sections were found along the route of the aqueduct. The aqueduct is named in various historic sources as "Qanat al-Barda" (Arabic: the cold canal). This name probably was based on the Barda gorge south of Damascus, or the Yerdeh spring east of Tel Gezer (although it was not the source). The PEF survey mapped it, naming the aqueduct as "Kanât Bint el- Kâfir" (Arabic for "the daughter of the pagan canal”, the natives did not know why). 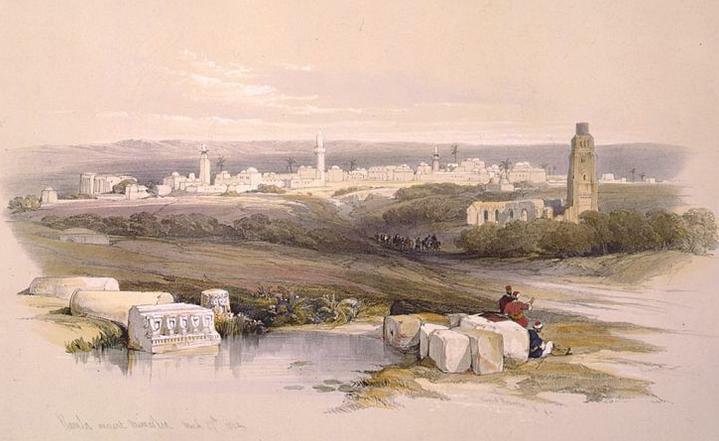 The survey report of 1875 had that the source of the waters were from the Ottoman village of Abu Shusheh southwest of Tel Gezer, and explained its name on a local legend (Vol2, p. 444): "Abu Shusheh is said to derive its name from a dervish who prayed for rain in a time of drought, and was told by a sand-diviner that he would perish if it came. The water came out of the earth and formed a pool, into which he stepped and was drowned. The people, seeing only his topknot [hair] left, cried,' Ya Abu Shusheh' (' O Father of the Topknot'). 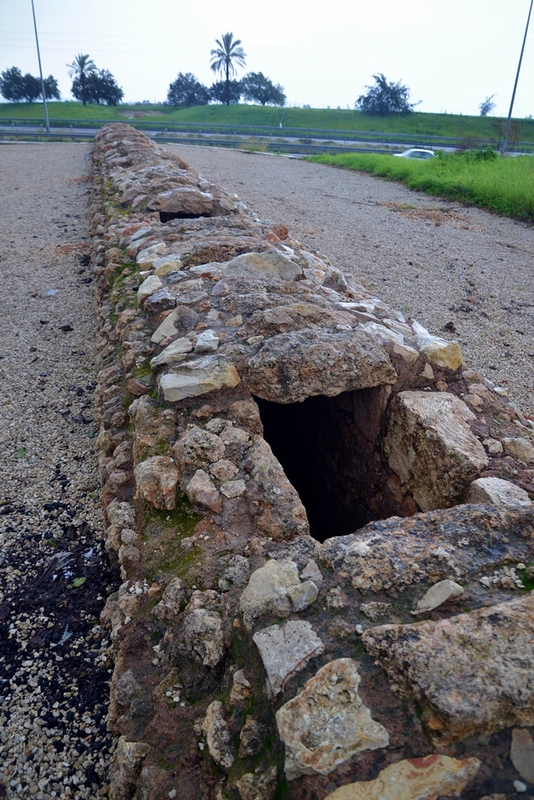 The base of the aqueduct is composed of fieldstones bonded with cement. On both sides of the base are two parallel walls, ~0.5m wide each and ~1.2m high, built of dressed limestone blocks. The cover above the aqueduct is made of a layer of fieldstones and grey cement. The cover stones are rectangular flat limestone slabs, 0.3 by 0.8m and 0.12-0.15m thick, that were laid crosswise over the side walls. The width of the aqueduct is about 1.5m. The walls and the bottom of the channel were plastered with two layers, as seen below. 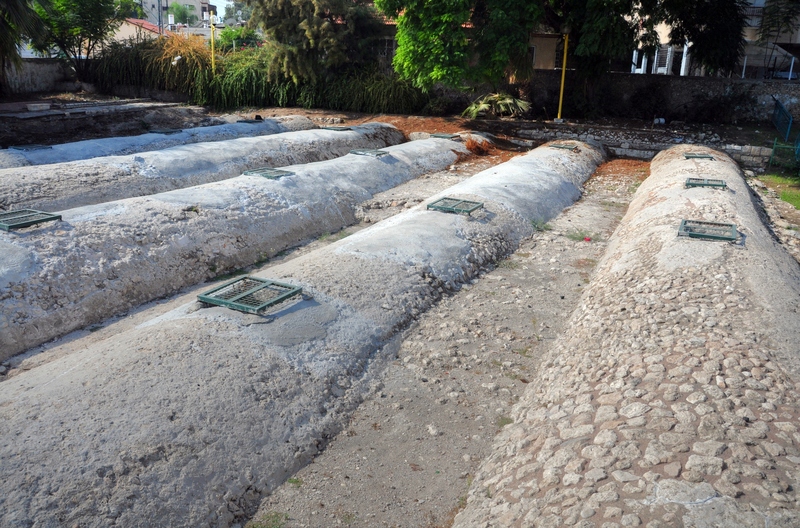 Manholes, used for maintaining the aqueduct, were also found in the excavations. The gradient of the aqueduct was 0.12% in some of the excavated areas. The maximum flow rate was 700 cubic meters per hour, assuming width of 0.5m and height of 0.6m. This water supply system, one of the largest in the Holy Land, was capable of supporting a large city of thousands of people. Christian: Cistern of Helena - a Christian common name, who mistakenly attributed this structure to Helena, mother of the Constantine the Great.